Path: ran from gym to park, 1 loop around reservoir & ran 1/2 way back to gym. 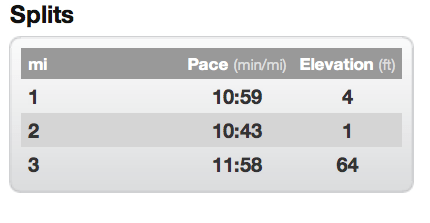 Injuries: wore compression sleeves (& shorts) which helped with shin splints , hip had overall dull annoyance. Went to yoga right after to stretch it out. Categories: Uncategorized | Tags: 2 miles, 5/31, central park run, easy run, evening run, run, splits, stats, training, training run | Permalink.